The exterior of your home can take a beating during cold weather especially here in Wyoming where the winters can be harsh. Here are some tasks you should add to your March To-Do list to get your home back in shape and ready for spring. Make sure gutters are cleaned properly before the spring rains set in. If you’re not comfortable doing the task yourself, it can usually be carried out by a local handyman or roofing company. While it’s often not advisable for you to climb up on your roof if you’re there to clean the gutters, take a few moments to fully inspect the roof shingles. Again, if you’re not comfortable with this task, a qualified roofer will be able to help you. Your bushes, flower beds, and other exterior items need to get some attention before the spring season really gets rolling. Prune and trim bushes, get the lawn furniture out and ready for use, and give your yard its best chance to shine by reseeding any bare areas. 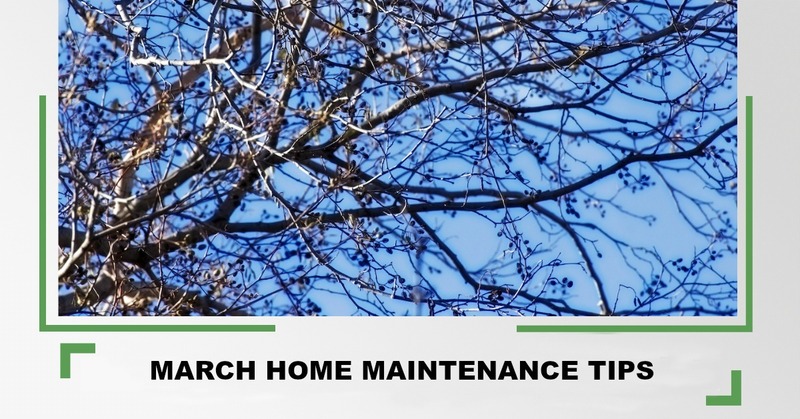 Late winter is one of the best times to administer preventative care for trees. By thinning and pruning, you’re prepping trees for spring and summer growth which can bring tremendous benefits. A certified arborist, with the proper equipment, can best identify which limbs should be removed. Your home’s siding, concrete paths, pads, driveways, and any wood decking should be cleaned to get it ready for warmer weather. Winter’s grime and residue can make your home look dingy and dirty. A good power washing can make all the difference, whether you tackle the task yourself, or hire someone to do it. Consult the weather forecast to know the last frost day. Prepare your to plant some vegetable or flowers in your garden as the summer season approaches. Clean the garden tools and remove rust in preparation to revive your gardening skills. Let’s face it, tending your lawn is a tedious task. While it may still be chilly outside, the grass will be greening up before you know it. Now is a good time to consider a full season lawn care program. A scheduled program ensures your lawn is properly seeded, fertilized, and conditioned. Clean out the pantry and the fridge for any leftovers that cannot be used. Donate foods that are not expired but have been sitting in the pantry for a while. Check the plumbing and clean out the clogs in the sink. Clean out the close of any clothes that you haven’t worn in over six months. Check out other items like collectibles that are filling up valuable space. Organize the closet in an order that makes it easy for you to pick an outfit. Take time off your busy schedule and plan a general spring cleaning. It should include cleaning windows, vents, the chimney and fireplace, floors, fridge, and dishwasher. The cleaning will remove the dirt that has piled up like grout on tiles. More than just tossing out old items and rearranging the house, your March To-Do list can actually make your home last longer, look better, and be ready for any kind of weather. If you’re looking for an ISA Certified Arborist in Arapahoe, Lander, Riverton, Green River, Thermopolis, Shoshoni, Fort Washakie, or Rock Springs, Cedar Mountain is your Top Rated Local® Tree and Lawn Care company in south-central Wyoming. Don’t hesitate to contact us today if you need tree care and/or lawn services. We’re proud to offer the highest quality services in the industry and won’t cut corners when it comes to helping you maintain a healthy, beautiful, and safe yard that everyone will enjoy!